:) Maybe...just maybe we share this resolution. cant get better than this.. I wish I had brains enough to understand that. Is it? I intend to do this in one year. Yep, and happy marriage Madhu. hmm interesting anshul...i am sure it will be a beautiful experience defining yourself...i have none as of now..lets s...wishing you a very happy new year.. Okay, lets make it a mutual symbiotic relation between Success and me, I run towards it, it runs towards me, and we meet soon, sooner than stipulated time. You've got to run, if not after something, then something's after you and you have to run. So better run with a desire to catch up. Not in the fear of being catched up. Happy New Year to you too S.
okay am dumbfooled now, there are two 'AS' commenting. One from open id and other from blogspot. Are you two same? I don't think so but still, are you? i guess i'll accompany you.. for every time i think i know myself.. i encounter something new. phew..
Can we have the definition please?? Hmm, I have always wondered why u call yourself Blasphemous Aesthete. Uff even typing that was complicated. he he. Good one.. With you we can always expect something different! amazing! i think it will be a complicated, long drawn out process though. But good luck and best wishes! The pursuit can be the same, am not sure of the paths. No, as I said, no explanations offered. Its your own judgement. Doesn't that count health as one factor too? Alcohol damages liver. Of course, but then we have an year at hand. Thank You. I had a resolution once some 4-5 years back, that I'd never make a resolution and I'm sticking to quite well ever since. All the best, may you see success. Thank You. Is that face your's or just another disguise. Kidding. Good to hear that you are sticking to it. Hey, we are not talking of breaking any, not yet. Interesting & hope you succeed..
Hope this year brings you success & helps you in achieving your goals..
Quite an intteresting blog you've got out there! and even better of a resolution. now that's a resolution that could occupy a lifetime! All the best! Revolution? Dude, we are engineers, don't you know what that means? Yep, I am sure it will be good. I have a good deal of the year to do that. And sometimes, it won't take a moment. It's all about the situation. Have a happy and creative 2011! i wanted to know...If i have to visit the dentist ? no, it wont be necessary. Contradicting, I don't see how. Perhaps you might want to elaborate? That is something for me to decide, on my blog, or otherwise. Isn't undefined more fun...why limit yourself? 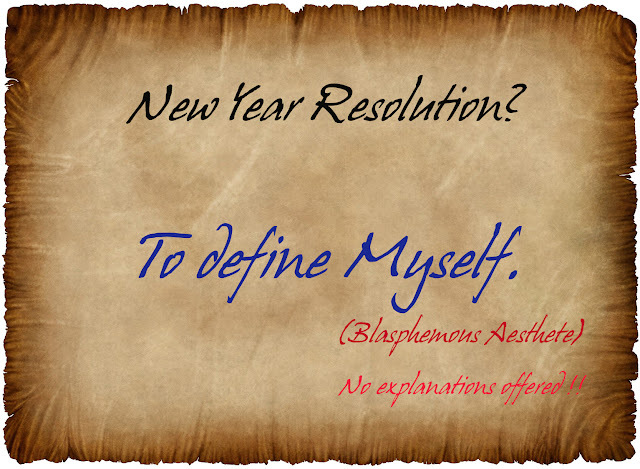 Is that the same as you being fine before the New Year but you're hoping to lose some fineness and get defined? I say stay fine. I wandered over via Tabitha Bird whom I found via The K is no longer silent, where I saw Tabitha's name and thought of The Tale Of Tabitha Kitten (by Beatrix Potter - which I remembered from being a kid) and then thought how lovely in a contrasting and unlikely marriage, to have a bird and a cat in one name....and you had left a comment there and your name is intriguing also. Glad I cleared that up. Happy New Year. I need a yardstick at least. I might break it tomorrow, but still, we were not headed no where when we landed on moon. well, I did not look from that perspective, de-fine. You got me thinking. Thank you for rendering another angle to it. And how are you going to define yourself? =P i know it sez no explanations offered...but still! all the best :D that's one of the toughest thing to achieve.. Interesting. When you do put it in perspective...I am sure it will be an interesting read. To define yourself literally? Do we really know who we are truly? I dont. Dont even know if defining myself is possible. Whats your take? well I am offering no help. yes, but why would one settle for the easiest when the prize is worth it? Perspective? I don't know if you could look from mine, we al have our own. We do, and we often run from it. I won't. I'll accept it, among other things. it's a very interesting "project"- to define oneself..I have still not managed to get it done..
Hmm...interesting resolution u choosed...And I think it's the best resolution. Interesting..I was thinking considering your blog really nice, define, or re-define?? Anyway, all the best man!! And a very happy new year! okay, and best of luck with your own. Because, for me, being happy is not a resolution, but a state. thank you. Well, you were considering it, what about now? Hey Anshul, I only just saw this post. I have a similar resolution for this year. Shal try and be myself and that way define myself. Either? I don't think so. I have never tried this before.